Bread roll is a good party snack made by stuffing spiced potatoes in bread slices. 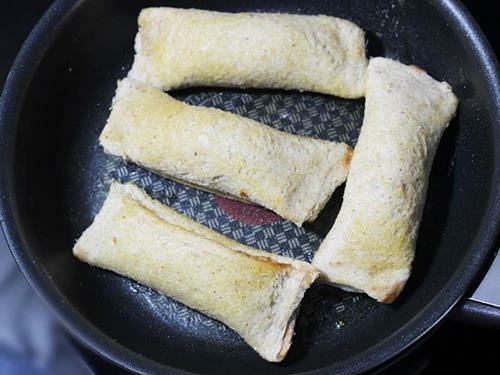 These are rolled and either fried or baked. 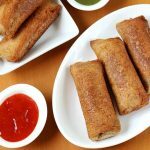 This post shares 3 ways of cooking the bread roll – shallow fried, baked & tawa fried. 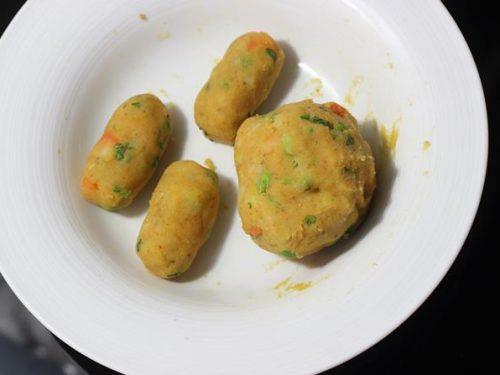 The preparation of stuffing is just very simple and needs only mixing up the ingredients like boiled or steamed veggies, garam masala and other basic ingredients. 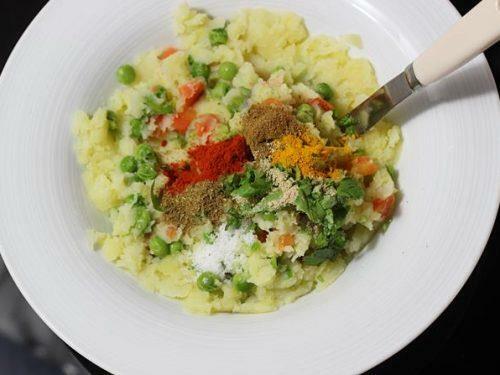 The stuffing is almost similar to the aloo paratha except for including peas and carrots in this. Bread rolls are usually deep fried but they are best baked or pan fried. However I have also shared the deep frying method. 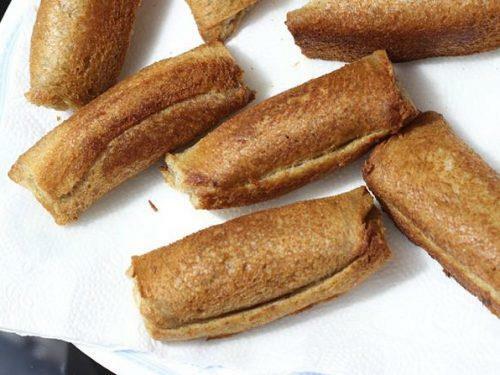 These bread rolls make a very good party snack since they keep crispy for long time. 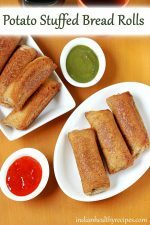 They are best served with Green chutney or Schezwan sauce. 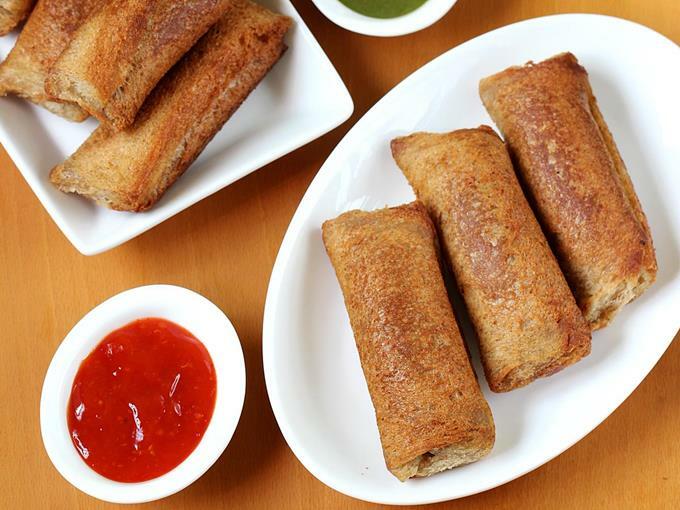 Bread roll is a potato stuffed bread snack popular in India. To make these bread roll, boiled potatoes are spiced and rolled up in bread slices. These are usually deep fried but are great even if baked or pan fried. This recipe shares all the 3 ways to fry bread rolls. Wash and peel the potatoes. Cut them to 2 and add to a pressure cooker or pot. Pour water just enough to cover the potatoes partially. Pressure cook for 1 to 2 whistles on a medium flame. Potatoes must be just cooked and not mushy. If using carrots and peas, you can just cook them in the same pot after removing potatoes. 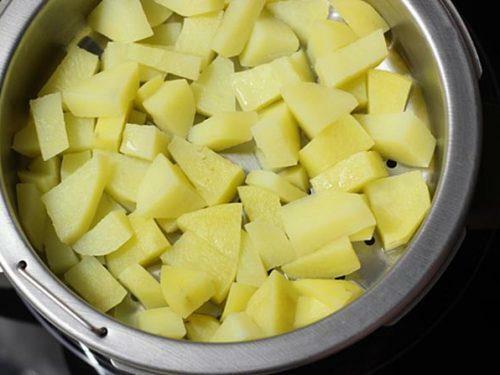 You can also steam the potatoes in a rice cooker until they are cooked al dente. 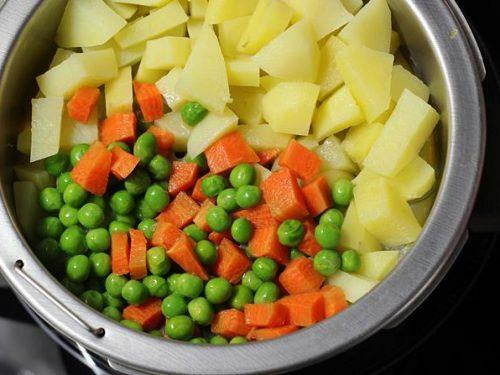 Move the potatoes to a side, add carrots and peas to the steamer. Steam until the carrots are tender. 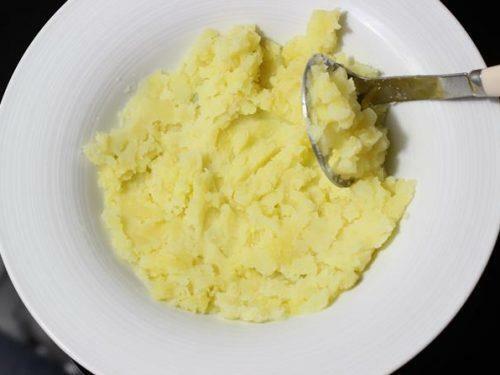 Mash potatoes or crumble them. Add carrots and peas, slightly mash them. Add chili powder, garam masala, turmeric, salt, coriander leaves and amchur or lemon juice. Mix everything well and check the salt. Divide the mixture to 10 equal balls and make an oblong or oval shaped balls. Set these aside. Trim the edges of the bread. Begin to roll them with a rolling stick to flatten them like puri. Flatten to a thin sheet. 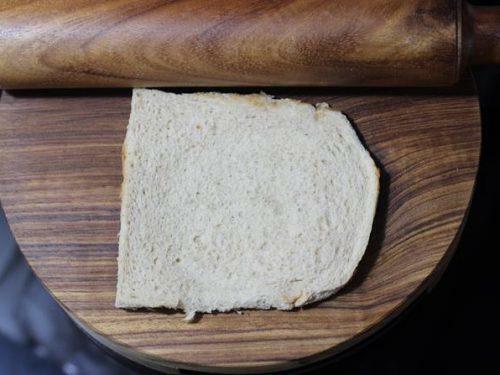 This prevents the bread from absorbing oil. Stir 2 tbps flour with half cup water. Set this aside. Smear the milk or water all over the bread slices with your fingers or brush so that it turns moist and wet. But not with excess dripping water. Smear the flour mix on the edges. Place one ball towards one end and begin to roll. Stick the edges together and seal the inner filling. If needed apply more flour mixture on the edges. Transfer them to a plate and keep them covered to prevent drying. If the rolls dry up then the edges will open up. 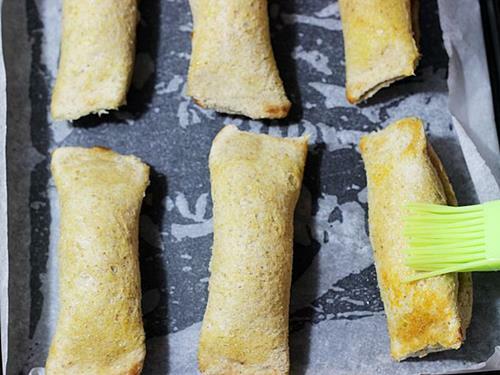 For baking – preheat the oven to 200 C. Brush the rolls with some melted butter. Bake for 10 to 12 mins or until golden on both the sides. 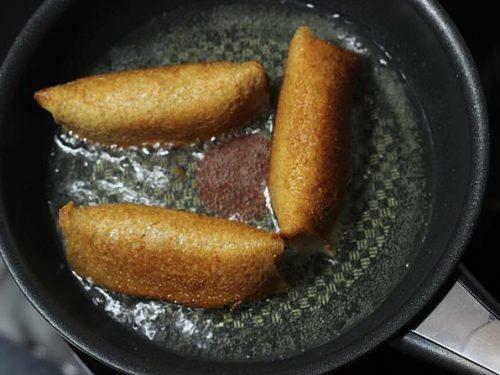 Pan frying – Brush the bread rolls with a generous amount of melted butter, ghee or oil. Heat the pan until hot and toast these until golden. These rolls do not get even golden color but will turn crisp. Heat only a few tbsp oil, just enough to partially cover the rolls while frying. When the oil turns hot, drop a small piece of bread. It must rise without browning quickly. Make sure the oil is hot enough. Then drop 2 to 4 rolls at one time depending on the size of the pan used. Fry until golden. Flip and fry evenly. 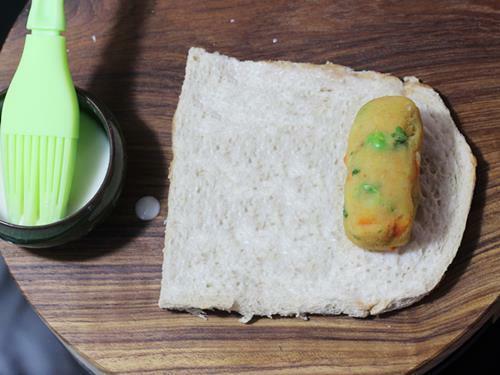 Remove the bread rolls to kitchen tissues. Serve bread roll with sauce or green chutney. 1. Boil potatoes in whatever way you like. I steam them in a cooker. It takes about 6 to 7 mins, it may vary depending on the kind of potatoes. 2. When they are 3/4 done, then i add carrots and peas to the same steamer. Steam them together until done. You can also skip carrots and peas. 4. Add peas, carrots, chilli powder, turmeric, garam masala, amchur, coriander leaves and salt. 5. Mix together and divide the mixture to 10 parts. Give them a oblong shape. Set them aside. 6. There are 2 ways of making bread rolls. First one is to dip the bread slice lightly in water and squeeze off the excess water. Place the stuffing and roll it to seal well. 7. I am following the other method of rolling the bread and smearing some moisture to make it wet. Roll each of the slice with a rolling pin. This prevents the bread rolls from absorbing too much oil. The bread slice must become like a thin layer first. 8. For the binding or to seal the edges I have used flour mixed with water. In a small bowl mix flour with water. The mixture must be thin of runny consistency. 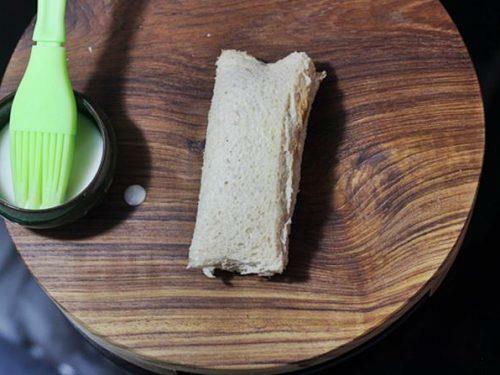 Brush the bread slice with the milk or water. The bread must turn moist and wet but not with dripping water. 9. Place the potato mixture on the bread. Smear the flour mixture on the edges to seal safely. 10. Roll the bread and press the edges gently to seal the potato stuffing. Use more flour mixture on the edges if needed. Finish making all the bread rolls. Keep them covered. 11. If you prefer to bake them, preheat the oven at 200 Degree C.
12. Brush the rolls with melted butter. Bake for 10 to 12 mins or until golden. 13. For pan frying, toast them after brushing with butter. Then drop 2 to 3 rolls depending on the pan size. Fry them on a medium high flame. 14. If shallow frying, Add oil only a few tbsp or as needed. Allow the oil to turn hot enough. Check if the oil is hot enough by dropping a small piece of bread. The bread has to rise without browning quickly. Flip them and fry on all the sides until golden. 15. Drain bread rolls on a kitchen tissue. Best served with green chutney and a cup of black tea. 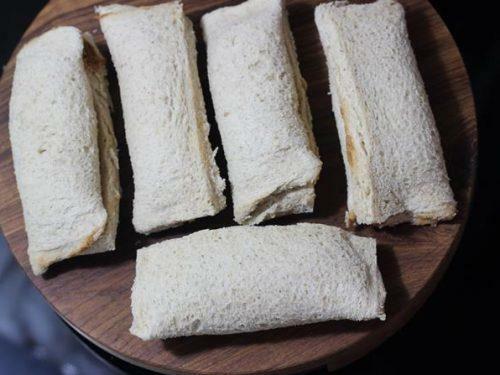 Hai, we can use old bread for bread rolls. YES Kavitha you can use left over bread. It must be soft though otherwise you cannot roll them. Amazing and easy to make recipes. I love the way you had made it so easy for the reader. Thank you. Will definitely them out soon. Wow… such a great help? asmmm gii like every recipe ??????? Dear chef my bread gets broken while I’m trying to fold that. Can u assist me how to prevent this? These look yummy. Can these frozen and reheated in the oven to have after 2-3 days? No idea how the fried bread would taste. Haven’t tried it anytime. I love bread rolls both sweet and savory version. Yummy!! Hello,I have problem with my son which is 2 years old.he don’t eat food at regular time .plz give me some more recepies. And for making him healthy.